Today, there would be hardly someone who is not aware about the significant and amazing benefits of Yoga. It was the Prime Minister, Narendra Modi who gave the proposal to observe this day as International Yoga Day. Yoga is one of the ways to grow into a better human being with a sharp mind along with a good heart and a relaxed soul. By keeping all these amazing facts in mind, Arya College of Engineering And IT has celebrated the International Yoga Day on 21st June 2018 at Arya 1st Old Campus in which around 500 faculty members have participated. 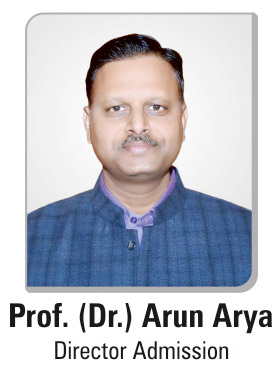 This event was conducted by Ms. Aditi Dadhich in the presence of Dr. Dhananjay Gupta, Chairman of Governing Body of Arya College of Engineering And IT who was the Chief Guest for this event. There were many activities in this event which have been conducted by Ms. Aditi Dadhich such as Pranayama, different types of Yoga like Anulom Vilom, Hatha Yoga, Ashtanga Yoga, Hot Yoga and also multiple tips on staying healthy and fit which are really helpful in stress management in today’s busy life. She also stated the fact that Yoga is an essential and a prominent way to keep the stress away and live a healthier life. This event lasted for 1 to 1.5 hours in which multiple activities related to Yoga and Pranayama has been performed by the participants. The ultimate goal of this event was to help the individuals to transcend the self and attain enlightenment. Arya College believes that Yoga is not a religion rather it is a way of living which aims towards healthy mind in the healthy body. International Yoga Day is really helpful in promoting a balanced development of all the three factors in the human being which are physical, mental and spiritual.